I shared this gluten-free kladdkaka over on Food Fanatic today and couldn’t wait to share it with you all! It’s another recipe from my book and the last one I’ll be posting. 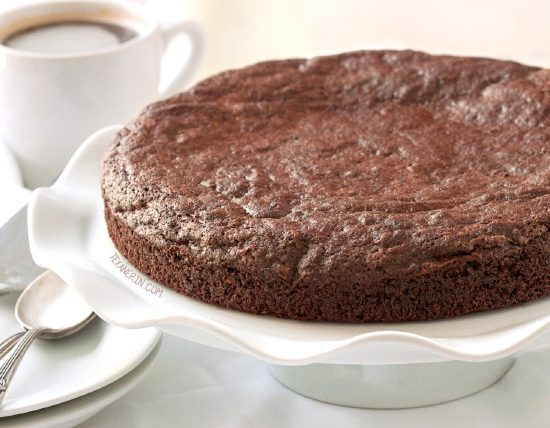 I’ve shared quite a few Swedish recipes and this kladdkaka is one of my favorites. Just like kanelbullar, you can find it in just about every other cafe in Sweden. It’s really popular and for a good reason. It’s kind of like a cross between a brownie and a cake and should, unlike my overbaked kladdkaka pictured, be super gooey! Kladdkaka is traditionally made with all-purpose flour and butter but by using buckwheat and coconut oil, it was super easy to make grain-free, gluten-free, and dairy-free. And I swear – it’s just as good and you can’t tell any difference! If you don’t have buckwheat, whole wheat flour works just as well for a non-gluten-free version. I’m pretty sure whole spelt would also work well. If anything, it’d just be even gooier! 103 comments on “Healthier Kladdkaka (grain-free, gluten-free, dairy-free)” — Add one! This looks like the perfect birthday cake for me to make tomorrow. I hope you enjoyed it and that you had a happy birthday! Sorry for my slow reply. This recipe was fantastic! I made this using Bobs Red Mill 1-1 GF flour in place of buckwheat flour and used butter. I live at a high altitude and wondered how it would come out. Made it for my son and he raved about it. Chocolatey and moist! Will definitely make again. Thanks for sharing! Does the texture change much after its been in the fridge? I’m so sorry for just now seeing your question! I haven’t made this in a while (which I plan on changing this week!) but I believe it gets fudgier in the fridge. :) Hope you’ll enjoy it! This looks so good! Do you use your this base for any other recipes? Hi I was wondering if you can make a different taste then chocolate to it. Cause I’m not a big fan of chocolate? Title is misleading it says grain free yet it calls for buckwheat which IS a grain according to Dr Peter Osborne. I follow his No Grain No Pain method of living and thought I might have a dessert to try. Thank you for sharing your recipe! It looks yummy! Can you make this with coconut butter instead of coconut oil? Hi Jamie! Unfortunately not. Coconut butter and oil aren’t really interchangeable. Other types of oil would likely work – I’m thinking olive oil or something neutral tasting like grapeseed or canola oil. I tried making this and cooked it for 14 minutes and it’s not moist or sticky inside:( it’s quite dry actually! Any advice? Would it just be cooking it less or is it perhaps my dairy free butter didn’t add enough moisture? The batter was quite thick. Hmm. I think that’s the first time anyone has said it’s dry! Did you make any changes or subs at all to the recipe? Did you maybe use a black pan? I live in Germany and they have black pans here for some reason. They make everything turn out overbaked. Or is your oven maybe running hot? I don’t think it was your dairy-free butter. Thank-you! All the best from Germany! Ja wirklich? Alles Gute aus einem Kanadieren in Bremen! Thanks for posting! I substituted 1 cup of date paste mixed with a cup of water for the sugar. Amazing taste and so moist. My husband wolfed it down. It will now be my go-to recipe for chocolate cake cravings! How much water did you add to the 1 cup of dates when making the date paste in addition to the 1 cup of water that you added? That was it. Just the one cup of water makes a nice, gooey paste and I found no need to add more. But you may feel differently as you experiment. Love this! Thanks for sharing such a yummy, easy dessert. Also thanks for being brave enough to put your work out and open to the rude comments that seem so prevalent. You call this recipe grain free but buckwheat is a grain. Thanks for the wonderful recipe! Before I make it can I ask if the 141g is the total amount of buckwheat flour, two tablespoons included? And ahould the half cup of regular butter be melted? Whoop whoop! Super excited have just ordered your cookery book on Amazon :-) I didn’t know about this book, and only found it through your PInterest post! Will definitely post a review after hubby and I have tried a few recipes. Thank you. I wanted to share a few substitutions I made. I used 1 cup of Bob’s Red Mill 1 to 1 baking flour in place of the buckwheat flour. I also subbed natural cocoa for dutch cocoa as well and I dropped the sugar to 3/4 cup as my family prefers a darker chocolate taste. (I was out of dutch cocoa) My cake took around 10 minutes to bake. It turned out great with my substitutions. It was super moist and gooey with set edges. Next time, I may check it at the 8 or 9 minute mark to see if I could take it out then. Overall, everyone loved it and it turned out great. Thanks! I’m so sorry I just now saw your comment! Raw cacao should work fine. I used Dutch-process because I like the darker taste. And since the brownies are baked, anyway, the raw stuff is no longer raw. It’s more expensive so I always save that for raw goodies. :) I hope you’ll enjoy the brownies and sorry again for the slow answer! Can i sub almond flour for buckwheat flour? Unfortunately, nuts flours aren’t interchangeable with non-nut flours. Sorry about that! I was looking for something quick and easy and dairy-free and chocolate-y to make today so I settled for this recipe. It is soooo simple and yet so good! It’s almost gone and yes, 15 minutes was just enough time for it to bake using the buckwheat flour. Thanks for sharing! Is there another option besides butter for this recipe? You could try ghee or vegan “butter” though I haven’t tried either in this recipe so I’m not positive that they’d work. Do you happen to know if there is any other gluten free flour that can be used as I am allergic to buckwheat? Thank you so much for such a quick response. I am the only one in my family that is gluten free, so I don’t usually make very many treats just for me. Just wanted to say that I made this for my birthday cake this year – I enjoyed a slice in the garden with a cup of tea! It’s great – really tasty, we all loved it. Thanks for the recipe! I’m so happy you liked it! I hope you had a great birthday. :) Thanks for your feedback! I’m wondering if anyone has tried to make throws with a sugar substitute like swerve or truvia? I’m trying to kick the sugar habit but not give up gooey chocolate!!! If I try it, I’ll let you know. Buckwheat is not a grain – it’s a pseudo-grain. Please see the note below the recipe concerning this topic. Hi, this recipe looks wonderful! I’ve made it sveral times without noticing that the amount of butter is 1/2 instead of 1/4 but I was adding some milk and it turned just fine ;p . Now I wonder If it will work with coconut flour or not! I should give it a try! Oh no! I’m sorry about that. I have no idea what the problem could have been. Maybe it was an issue with the ingredients? I’ve made some recipes a dozen times without problems and then I switch brands and then it comes out totally different. I hope the cake is still edible! Sorry I couldn’t be more of a help. My batter didn’t get very gooey, but very sticky (basically a big lump)..any idea what might’ve gone wrong? That could be it! If the fat hardens, the batter will be quite thick. Next time, make sure the fat is still warm. :) I’m happy it came out well! I made it with whole wheat flour. Very good. Like a dense brownie. I made it side by side with your peanut butter bars recipe. My kids loved the peanut butter bars and I loved this one! I’m happy you all enjoyed the recipes! I especially love this one, too. Nice and dense. :) Thanks, as always, for your feedback! Can I make this egg free for my vegan son – I thought of using egg replacer and flaxseed meal (which I often use as my egg replacer). Joanne, did you have any luck making it egg free? I can’t eat eggs but would like to make this for Saturday. I haven’t tried it but 2 flax or chia eggs may work! Super gooey brownie cake? That’s it! I’m moving to Germany so that we can be neighbors! I’m a brownie lover and I love the fudge like brownies….so from reading about this cake I have a feeling that I would go crazy for it! You over baked it? From your photos, it looks moist and I just want to take a fork to dive right in! I can see why everyone inhaled it. I can’t only imagine how gooey this cake must be cooked 6 minutes less! You always introduce me to new and exciting things. This looks delicious. Mmmmmm…gooey chocolate. I keep gathering up your recipes featuring buckwheat flour so that I don’t waste the next bag I buy (like I did the last one). This just shot straight to the top of that list! Erin, do you use coconut oil or butter? Like the others who have already commented – I haven’t heard of kladdkaka either – but it looks delicious! How come you post so many Swedish recipes(I think it’s awesome btw)? Do you have family or friends there or something? I had never heard of kladdkaka before but the name sounds fun and I definitely want to try your recipe! 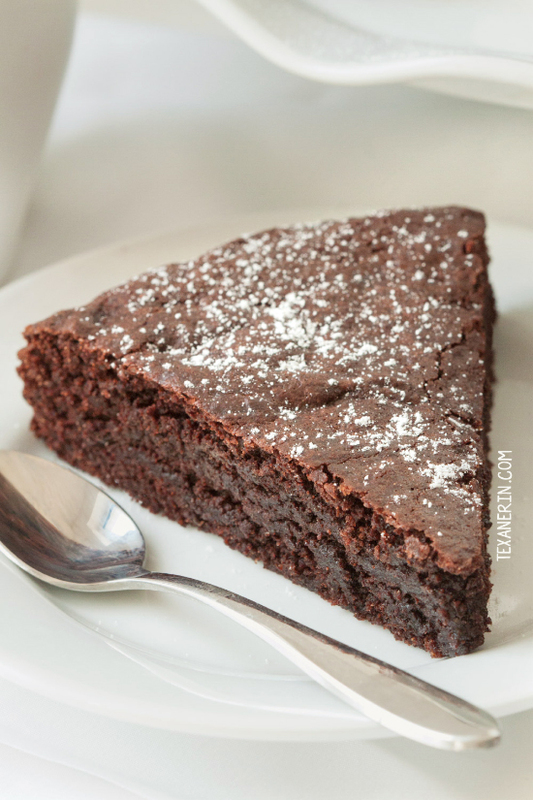 Perfect to satisfy a chocolate craving :) I made your healthified brownies once and they were delicious, I’m sure this cake will be just as good! I’m so happy that you liked the brownies! 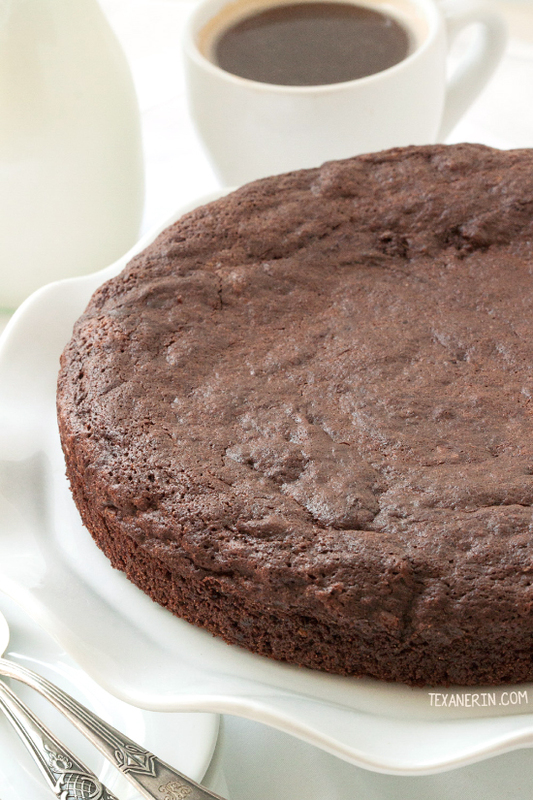 If you like gooey things like those brownies, I’m pretty sure you’ll love this cake. :) I hope you’ll enjoy it as much as we do! Well, needless to say I have never had this. Neither can I pronounce it. HAHA!! It does look good. To me, this cake looks perfect. Granted, I don’t really know how it is supposed to look, but it looks moist and decadent and I want to try it right away! I can’t imagine how I managed to miss this in the book!